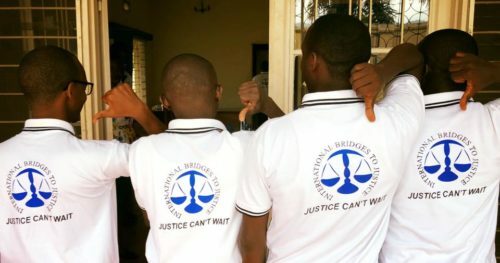 When IBJ first came to Burundi, there were only 70 lawyers working in the entire country, and there was no form of legal aid for its approximately 9 million people. This is not surprising given that Burundi ranks among the three poorest countries in the world. With the agenda for development straining to meet a myriad of urgent needs, few resources are directed towards fostering the rule of law. IBJ recognises that local criminal defense attorneys operate on the front lines to end torture. In April 2015, following the announcement of President Nkurunziza as a candidate for a third term in office, Burundi once again sank into serious political instability. This has led to an outbreak of numerous demonstrations in Bujumbura by members of civil society and opposition parties, provoking violent clashes with the police force resulting in mass arrests. Those arrested are being held in appalling conditions, with most prisons at an occupation rate of over 200 percent of total capacity. In fact, by the end of 2016, the penitentiary population has reached over 10,000, while the detention establishments’ normal capacity is only to hold 4191 people. Of the 441 detainees assisted by IBJ in Burundi in 2016, 19 percent of them alleged being subject to torture. The rate was about 13 percent for the first quarter of 2017. In wake of the grave situation Burundi, many human rights NGOs have left the country. IBJ is one of the the few remaining NGOs providing legal representation to detainees, assisting anyone who cannot afford a lawyer. IBJ lawyers continue their efforts, taking great risks to provide services to accused persons even during a period of political crisis. Despite the tense political situation, the government granted authorization for IBJ to register as a local NGO under the name, Burundi Bridges to Justice. The creation of this legal entity enables IBJ to apply for funding that is reserved locally registered NGOs. Legal assistance – BBJ has assisted over 2,000 detained individuals since its Defender Resource Center was established in Bujumbura in 2008. Between March 2016 and March 2018, BBJ has provided 486 individuals with legal assistance through the support of GAC. BBJ has one Defender Resource Center. Defender Training Sessions – A total of 29 lawyers were trained on access to justice and strengthening the rule of law in Burundiin partnership with the Burundi Bar Association (BBA)in August 2017. The aim of the training was to provide intensive skills training on the procedural, legal, and practical elements of criminal defense whilst providing community building opportunities. Rights Awareness Events – BBJ have conducted 4 rights awareness events directly reaching 638 people, and over 5590 people indirectly. 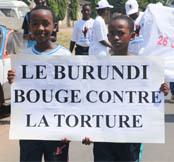 Each event had varying objectives, including improving the the populations’ understanding of legal safeguards that protect arrested persons in Burundi. The first rights awareness event invited 68 individuals, each of whom belonged to a community of 20 people or more, and focused on informing people about their fundamental rights. The second was held in an all-girls boarding school and contained a central message on protection against torture, with a brief introduction on human rights in general. Further events were held in the Central Prison on Mpimba, and in the Mubimbi District of Bujumbura Province, where 117 members of the community gathered to learn about their legal rights. Each event used a different methodology depending on the audience, which included role plays, posters, videos, PowerPoint presentations, and team led discussions. Justice Roundtables – BBJ have overcome political tensions and strengthened collaborative efforts between justice system stakeholders by successfully convening three justice roundtables with the authorization of the Minister of Justice. A total of 77 key justice sector actors have participated in the roundtables including judges, court clerks, prosecutors, judicial police officers, prison officials, and lawyers. The roundtables have facilitated discussions on the cause of delays in processing cases, promoting communication between different actors of the penal system, and the implementation of the legal safeguards of the accused. In May 2018, BBJ in partnership with the General Inspectorate of Burundi National Police, completed an intensive training of 150 judicial police officers. Ceremonies were organised under the patronage of the Ministry of Security and Fight Against Disasters. 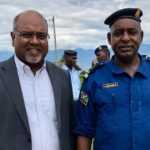 Both the General Inspector of Burundi National Police and the Minister were thankful to BBJ for support that arrived at the right time. In his address, the Minister of Security advised the officers to implement what they had been taught and contribute to solving abuses that are reported against officers on the ground. He insisted that they have been trained to serve citizens. Their wish is that BBJ keeps supporting similar training as they hope to train a further 200 officers which would enable them to appoint at least 3 judicial police officers per commune. 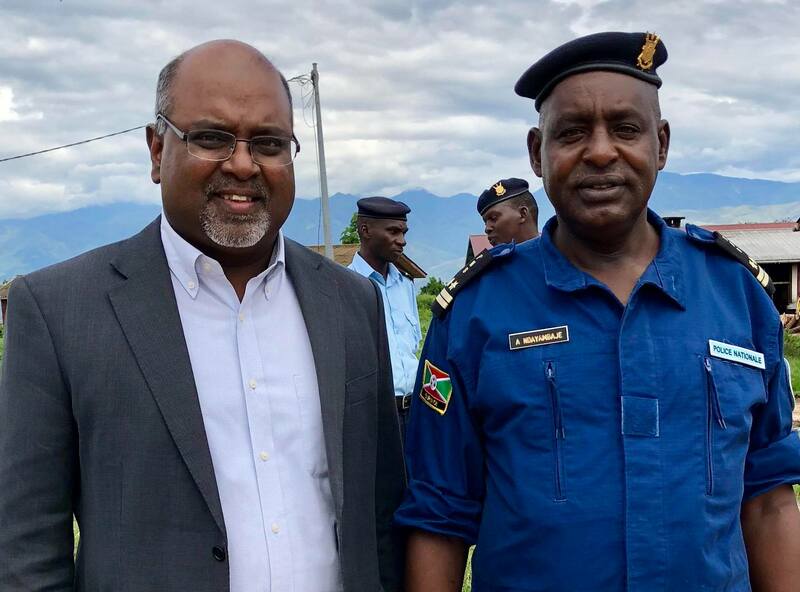 Sanjeewa Liyanage with Andre Ndayambaje, Inspector General of the Burundi National Police, who welcomed him to show off a class of new police recruits at the Gatumba Police Training School, whose extensive training was supported by IBJ Burundi/Burundi Bridges to Justice.